Regular Asphalt & Rubber readers should recognize the name TVS as the brand behind BMW’s small-displacement lineup of motorcycles, with the Indian firm also releasing its 300cc-class sport bike, the TVS Apache RR 310. Here is another reasons to take notice of the TVS Motor Company though, as it just debuted a hybrid gas-electric cruiser concept, which not only is interesting from a technical perspective, but it looks pretty good too. For the Western world, the TVS Zeppelin isn’t going to blow the doors off the market, at least not with the quoted specs, but TVS does have some clever ideas for the model. Episode 68 of the Two Enthusiasts Podcast is one of our last shows recorded in 2017, and it’s a good one. In this show, we start out with a discussion about the TVS Apache RR 310S – a bike that is very likely to become the basis for BMW’s next sport bike. This then leads to a discussion about the supersport class, and how to make more compelling models for enthusiasts. Our attention then turns to the coming rule changes for the World Superbike Championship, and the rumors of similar movements in the MotoAmerica Championship. These changes will also have effects on future production machines, which we speculate upon. The show wraps up with an interesting discussion about the motorcycle media landscape and what it means to be a “journalist” in this industry, and during this point in time in media consumption. All in all, it’s a very interesting show, and we think you will enjoy it. We have been patiently waiting for the TVS Apache RR 310S (formerly known as the TVS Akula 310) to debut in India, though probably not for the most obvious of reasons. Now, with only a matter of hours before it officially debuts, we have some thoughts on the newest sport bike from India. While we are intrigued by the new motorcycles that debut in India, the TVS Apache RR 310S is a bit more special for Western riders. Built in collaboration with BMW Motorrad, the TVS Apache RR 310S gives us our first glimpse into what the German brand’s 300cc-class sport bike will look like, which should hopefully debut late-2018. Based around the same 313cc engine (34hp) that is found on the BMW G310R and BMW G310GS, that TVS Apache RR 310S is expected to be a BMW G310RR wrapped in different bodywork. The Auto Expo in India isn’t usually an event we would cover, but some interesting machines have turned up in New Delhi. 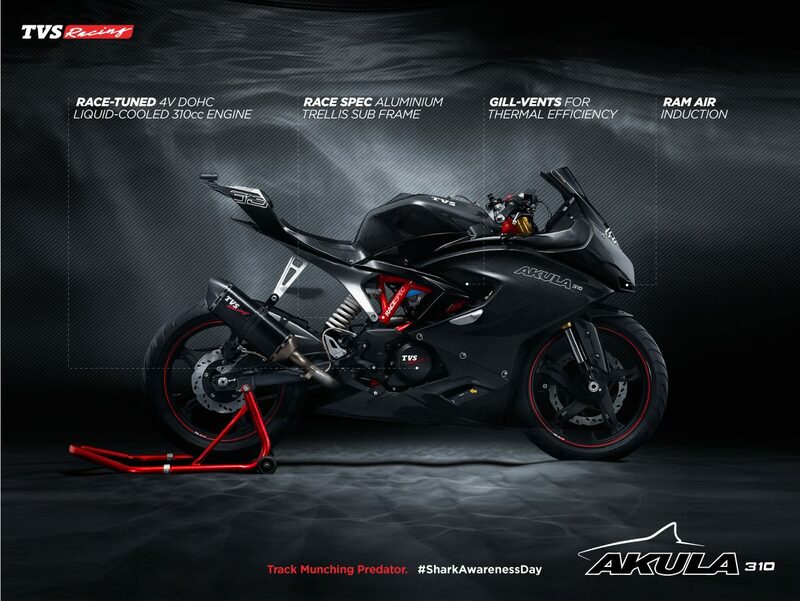 The first one to grab our attention is the TVS Akula 310. On its own right, the TVS Akula 310 is a sharp looking small-displacement machine, especially when its dripping in carbon fiber (Daddy like). Beneath the skin though, the Akula 310 is exactly the same as the BMW G310R sport bike, which is pretty interesting. This is because TVS and BMW Motorrad collaborated to bring both models to market; and as such, the Akula 310 gives us an idea of where BMW could be headed next with its 300cc class offering. Continued reports suggest that BMW is getting closer and closer to releasing a small-displacement motorcycle single-cylinder motorcycle (codenamed the K03), which is being co-developed with Indian brand TVS. The machine is expected to be in the 250cc to 300cc range, be engineered by BMW Motorrad in Germany, but built by TVS in India. Pictures of the test mule have been on the internet (see above), but the final design is said to be similar to the TVS Draken concept that we saw this time last year. Saturday is a rest day for the 2015 Dakar Rally, giving riders and teams a chance to catch their breath, tune their bikes, and hone the strategies for the next eight stages, one of which is a marathon stage, where the teams cannot help the riders work on their bikes. For KTM and Marc Coma, the day will be spent trying to figure out how to shake Joan Barreda from the four-time Dakar winner. For HRC and Barreda, the game is simple, cover Coma’s every action and don’t let him eat into the 12-minute gap that the Spaniard has built with his hard riding. Meanwhile, Yamaha Racing’s Alessandro Botturi has been waiving the banner for the blue and white contingency, which has otherwise had an abysmal Dakar Rally without Cyril Despres in its ranks — Despres is racing this year in the car category. Botturi is 11th overall, having made up some serious time during the shake up on Stage 6. Other rankings notables are Laia Sanz in 14th, the top female racer in the 2015 Dakar Rally. Alain Duclos of France is the top Sherco rider, which this year has partnered with TVS making the Sherco/TVS team. With a lot of Dakar still to race, expect these standings to still move around. After the jump is the full listing of all 110 bike entries to The Dakar. The big news out of India today is that the country’s fourth-largest motorcycle manufacturer, TVS, is in talks with Germany’s leading two-wheeled maker, BMW Motorrad. While there are few details on what is occurring between the two companies, it is being reported by the Wall Street Journal that TVS is hoping to get some technical know-how from BMW in making larger-displacement motorcycles. Likely to end in some sort of strategic partnership, BMW is surely eyeing TVS’s distribution network in exchange for its 500cc+ help, as all the major OEMs are currently jockeying for position in the growing Indian market. Other rumors around the deal suggest that TVS could help BMW create smaller-displacement machines, specifically designed for India, which would presumably also be available in other emerging markets like South America and Southeast Asia.